When you have limited mobility, something that was once simple can become much more complicated. For instance, getting into and out of a tub or shower or sitting down and standing up from the toilet can be difficult if you are unsteady. Handicap grab bars improve the ease and safety of day-to-day life for people living with limited mobility. At Allegro Medical, you can find a wide range of handicap bars for bathrooms of all sizes and layouts. 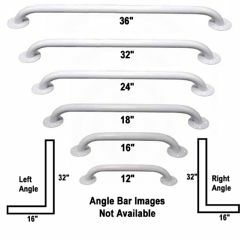 Portable suction grab bars and the more permanent, but more versatile, curve handicap bathroom grab bar can all be found here at affordable prices. White Powder Coated Grab Bar 12"